Happy New Year! 2015 is going to be our best year yet! What better way to start off the new year than with Farley and her Currently link party! Listening- I am NOT a Swifty, but I couldn't resist her new album. I love every.single.song. I may need an intervention soon. Loving-I create a goals list every year. 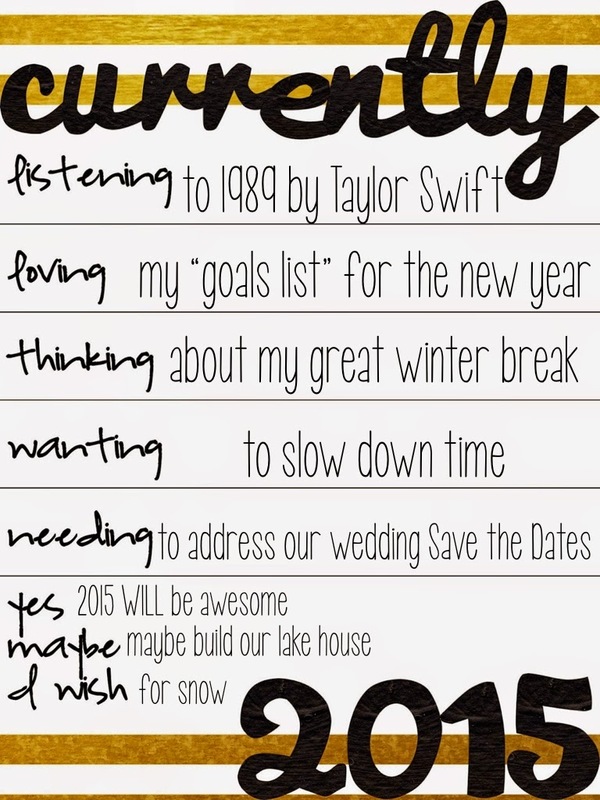 I am seriously loving my new goals for 2015. I really believe that positive energy is addictive, and I cannot wait to share all of that energy with you. Have you checked out one of my teaching goals for the new year? You can check out the video on my Facebook page here! Thinking-My winter break has been great. My family, who lives in Souther California and upstate New York both got to come have Christmas in the Smokies with us. It was such a wonderful experience. I have also gotten a lot of lazy time AND wedding planning done. I will be going back to work refreshed and ready for the second half of the year. Wanting- I really want time to slow down. Don't get me wrong-life is super groovy right now, but it is just flying by way too fast. Needing- I am slightly behind on our wedding save the dates. I need to address about 160 of them by next week. Anyone want to help? Yes, 2015 is going to be awesome. For reals. Maybe we will get to start building our lake house. Enjoy the remainder of your break, my friend! Stumbled onto your blog through Farley's Currently linkup! Christmas in the Smokies does sound gorgeous, even if there isn't snow. :) How nice that your family could travel to be with you guys. hey there! thanks for stopping by BigTime Literacy! I so know what you mean about the new Taylor Swift album....I have been listening to it on repeat since it came out! Good luck on your save-the-dates! When is the big day?! Lake house? I have a boat. When can I come visit? lol I LOVE the lake. I'll own a home on one, one of these days. Enjoy wedding planning. It can be a stressful time but worth every second. Happy New Year friend!